Taxi fares in Harrogate are set to rise from December after a ‘compromise’ was reached between the borough council and local firms. 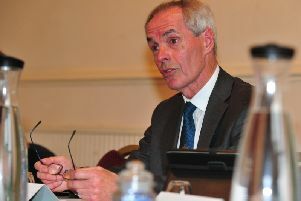 The council’s cabinet member for Housing and Safer Communities, Coun Mike Chambers, decided to implement a 3% rise in fares from December 1. However, the move has upset taxi drivers who were hoping for a larger increase. Coun Chambers had himself, earlier in the year, put forward a 2.5% rise in response to the Harrogate Hackney carriage trade asking for a 4.78% rise. Had the original recommendation from the trade been implemented it would have seen Harrogate have the 22nd highest cost for a two-mile journey out of 370 local authorities. Under the 3% rise, the cost of a one-mile journey will not change. A two-mile journey rises from £6.60 to £6.80, three-miles from £8.60 to £8.80, a five-mile journey rises from £12.20 to £12.60 and a 10-mile journey will increase from £21.80 to £22.40. The flag fall for journeys would also increase from £3.20 to £3.30. This will leave Harrogate joint 26th highest of all local authorities with fares averaged out over two miles. There will now be 10 days of further consultation on the decision with people in the Hackney carriage trade and the public and if there is no objecting the increase will come into effect from December 1. The last rise in maximum fares in Harrogate took effect on 1 May 2017 which resulted in a rise of 2.5% in the running mile and waiting time only. Kevin O’Boyle, owner of Central Taxis, and the longest holder of a taxi license in the district, has previously called on the council to consider a rise of 4.84 per cent, with full-time drivers currently working 60 to 80 hour weeks to cover rising costs. He said: “Its absolutely and totally disgusting, I don’t know where this compromise has come from. “We started negotiating this fare raise 12 months ago, last October, they dragged their feet and we have this pathetic increase and its taken 12 months to get that. “This increase was to cover rising costs and we don’t get that with a three per cent rise, the remaining amount will have to come out of the pockets of the drivers.